Developed by Atmos Nation, The Atmos Power Vaporizer is the perfect combination between a vaporizer and a power bank. We would like to introduce you a new product by Atmos! Developed by Atmos Nation, The Atmos Power Vaporizer is the perfect combination between a vaporizer and a power bank. It is compatible for charging most electronic devices, and features a LCD that updates the vital signs of the unit. Smooth, glossy, and compact, this unit is available in white, silver, and black. The Atmos Power vaporizer features a variable voltage vaporizer at the top, and a power bank compatible with charging almost any electronic device at the bottom. The LCD screen keeps the user update with the voltage, number of puffs, and the specific mode of the charger. The Atmos Power Vaporizer is approximately7 inches in length. 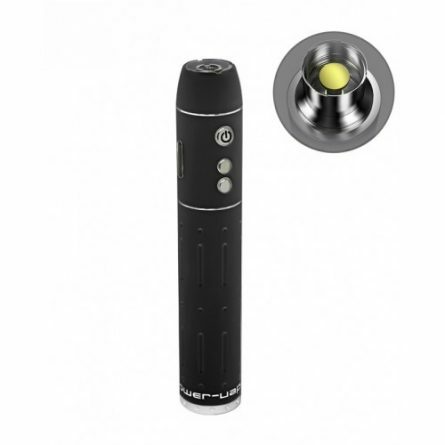 The Atmos Power Vaporizer is compatible with dry herbs and waxy concentrates. What does the Atmos Power Vaporizer Includes? Atmos RX offers a warranty on most of their products. The customer must keep the receipt as proof of purchase. The limited warranty only covers replacement of unused, defective parts for 30 days from the date of purchase. Once the product is used, there is no warranty available for cartridges/attachments for hygienic purposes. The warranty does not cover misuse, user error, the use of any illegal products, modifications, or alterations. Atmos RX does offer a one year replacement program for batteries, USB’s, and ceramic heating chambers for between $12.95 and $19.95, depending on the product.